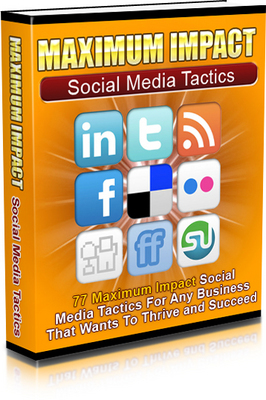 "Discover The Secrets To Generating More Traffic, Leads, and Sales By Piggy-Backing On High Traffic Social Media Websites..."
Using These 77 Powerful Tactics, You'll Generate An Unlimited Amount of Traffic To Your Websites! In fact, if you're looking to generate more leads and sales then this is exactly for you. If you're a beginner struggling to get traffic to your website then read on, too. Social media is what's taken over traditional forms of communication online. The Internet is now run by Web 2.0 technology where website visitors and members run the content of the site. A good example of a powerful social media website is Twitter. It is purely driven by its members. Members simply "tweet" their updates and those who are following will see their updates. * Websites such as YouTube, Facebook, Twitter, Blogger, and MySpace are in the top 20 most visited sites. You can generate massive amounts of free traffic from various high traffic social media sites. You can connect with people in your industry quickly and easily. You can become an industry expert in a matter of weeks. You can build a huge following, and people who want to listen to you. You can quickly and easily share your thoughts, tips, new product announcements, blog posts and more. Are You Harnessing The Power of Social Media Sites? Looking at the benefits above, you'd be a fool not to leverage your efforts using social media marketing. It's simply a no brainer. If you're driving traffic through various forms like Pay-per-click, article writing and submissions, blogging and affiliates then you simply must add social media to your arsenal. If you're just starting out, generating traffic through social media sites is one of the best ways to get started because it requires no expenses and hardly any risks. So the big question is, how do you get started? How can you build your brand online using social media sites? How do you make the most of it? How do you build your reputation from scratch? How do you generate traffic using social media sites? How can you build a big following of people in your industry? I've seen how frustrated people get when it comes to this subject, and I know you may be feelings this way as well, because you simply don't know how to get started, what to do, and how to make the most of it. Fortunately, I've created something you'll love. I've written a special report where I share 77 of my best social media tactics so you can generate more traffic, leads, and sales. I saved you the time and hassle looking elsewhere because I've compressed essential social media tactics into bite-sized pieces so you can easily digest it without suffering from information overload. Simply take a look at one or more of the 77 tactics, implement it, and get results! Creating a Facebook Fan page for your business for more exposure. Using YouTube to generate tons of traffic to your websites. How to improve your search engine rankings using LinkedIn so you can generate tons of traffic. Linking up with seasoned experts to gain credibility in your market. Getting others to promote your Twitter and Facebook page. Using https://www.tradebit.com to save time. How to use Twitter to conduct market research. Integrating your twitter feed with your homepage. Creating your own blog using Wordpress. How to use your Facebook fan page to send out information. Creating a free discussion forum on your facebook fan page. Creating an iPhone application that features your feeds from various social media accounts. How to create a "Tweet This" or "Post This to My Facebook Account" button. How to use YouTube to talk to your viewers directly so you can gain trust from your prospects. Starting a conversation to get your readers involved. Adding a "Google Buzz" button to your site. Using Twitter to grow your email list so you can send out your promotional offers. Referring new friends to your fan page. 32 Internet Marketing Plr Ebooks Package - Save Huge! 18 Internet Marketing Ebooks And Software Pak #1 Save Big!